Here's Lucy, Lucy and Sammy Davis, Jr.
Sammy Davis Jr. gets his nose slammed a few times into the Employment Agency's door when Lucy opens the door on him. He threatens to sue Lucy and Harry if his nose becomes swollen and it looks different for the movie he is filming. 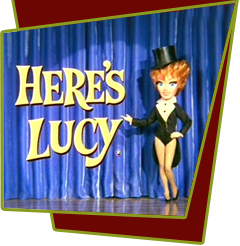 Lucy winds up following him onto the set of his latest film production, pleading with him not to sue. She follows him about to treat his nose and keep him out of trouble. Naturally all havoc breaks loose instead. Special Notes: Lucy's husband, Gary Morton makes an appearance as the Night Club Manager. Although writers Perrin and Goodman do the original draft of the script, consultant Josefsberg revamps the script and is given credit for the episode. Buddy Hackett had a cameo appearance but his part was cut out in the syndicated versions of the episode.